The IoT Sensor Badge is a sleek little promo board featuring the latest PIC16F18345 microcontrollers, a BLE module, five NeoPixel LEDs, an accelerometer and a temperature sensor, all powered by a single 1.5V alkaline (AAAA) battery via a small booster circuit. 1- Figuring out the protocol used by the IoT Badge to communicate via Bluetooth Low Energy. The IoT Badge promo web page contains a link to a downloadable MPLAB X project (zip) file. Once unzipped and opened in the IDE, it is easy to identify a module called “RN4020.c”. Unfortunately this is NOT where you will find the crucial bits of the BLE interface although, from the initialisation code, it will be revealed that the module is going to be used in MLDP mode! The true core of the communication interface is rather more cryptically hidden in the “interrupt.c” file where in fact all interrupt service routines are found. Hidden within the serial interface (EUSART) ISR lies the section of code we need to understand. When the ‘%’ or the ‘#’ characters are received a corresponding button press event is “simulated” by triggering manually the Interrupt on (pin) Change mechanism. This is a technique that I would not generally recommend but appears to be effective. All values are sent as decimal and are comma and space separated! This makes for a long but humanly readable format, although not exactly a compact or easily parseable one. The choice to make the temperature and battery voltage calculations in addition to the long string formatting and transmission, “inside” an interrupt routine is particularly troublesome to me. Although it is not the only issue I would have with the code exposed in this project, it is beyond the point of this post, so we’ll gladly move to the next step. 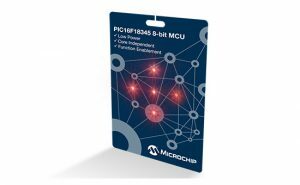 MLDP is the solution that Microchip offers to embedded developers (like me) who are looking for a quick way to emulate a serial point-to-point connection over BLE. In the original Bluetooth standard, the Serial Profile was offering this feature out of the box. With BLE, the old profiles are gone and replaced instead by the GATT, a very flexible (and power efficient) way to define and handle data transfer via the sharing and remote update of “characteristics”. MLDP brings back the simplicity of the Serial Profile to BLE by offering an alternate mode of communication between the BLE module (RN4020 for example) and a microcontroller serial port (UART). Once the BLE module enters MLDP mode, all other details of the BLE protocol are abstracted away and as soon as a connection is established with a paired device, full bidirectional serial communication is established. Except finding out which characteristics (and service) is being used by MLDP to perform the trick requires a bit of hacking. The official documentation is careful to avoid such details to maintain the full abstraction. But using MCHP own tools (such as the Bluetooth Smart Data application or the the Smart Discover application, both available on the Apple Store) it is quite easy to figure out the (long) UUID published for the MLDP service and its data characteristic. Armed with this information we can now proceed to create our Python script. The Core Bluetooth module (or simply ‘cb’) wraps nicely the functionality of the iOS BLE framework and its documentation includes two very useful example projects interfacing to similar embedded control boards. All the logic can be encapsulated in a single “class” whose methods will be used as “delegate functions” for each step of a BLE connection process. These “delegate functions” (or callbacks in embedded lingo) will ensure that we can find and connect with the ‘IoT Sensor Badge’ and the MLDP service/characteristic. Since the BLE protocol allows each characteristic to pass a maximum of 20 characters (bytes) at a time, the update delegate must perform a bit of buffering in order to re-assemble the longer strings the IoT Sensor is sure to send us. Pythonista 3 introduces a simple Console View for the iOS applications to provide a quick and dirty way to present data (and receive inputs) from the user without necessarily require a complete GUI to be defined. This code launches the Bluetooth core manager waits for the connection to be established with the first IoT Sensor Badge found and the starts the process of continuous update by sending a first ‘$’ command. This will quickly fill your iPad/iPhone screen with the strings sent by the IoT Sensor. Soon you will want to stop the script (use the little button at the top right of the console view) and inspect the data. Next, if you are like me, you will itch to create a bit of a UI for the application. But that is a completely new adventure, which we’ll cover in the next part … stay tuned! This entry was posted in PIC16, Python and tagged BLE, Bluetooth, IoT, Languages, PIC16, Python, Swift, UI. Bookmark the permalink.